The 501-11 Series from Conset is a heavy duty workhorse which features a Bosch motor to provide ultimate reliability. The height adjusts from 24.8125" to 47.25" at a rate of 1.1" per second, with an impressive lift capacity of 330 lb. An attractive modesty panel is included, in addition to a full-width cable tray for superior cable management. The unit is 77.37" wide and deep and will support a wide variety of stock work surfaces, and will also work with most custom tops. The entire base is powder coated in either Black or Silver color. The 501-15 Series is an economical, width-adjustable option for the base of an electric workstation. The Extender Rod (Drive Shaft) connecting the two legs can telescope from 40.9" (104 cm) to 70.8" (180 cm), allowing this base to accommodate a wide range of tabletops. This unique telescoping feature means that users must also supply a suitable privacy panel which matches the chosen frame width. Industry standard twist-lock connectors are included with the frame (see image in gallery). The height adjusts from 26" to 46.5" at a rate of 1" per second, with a lift capacity of 154 lb. An Anti-Squeeze Protection System will automatically engage if the resistance increases noticeably while moving down. High quality oversized levelers accent the feet of the base. Due to its innovative adjustable width feature, this base will support a wide variety of stock work surfaces and most custom tops. The entire base is powder coated in an attractive silver color. The 501-17 Series from Conset has two features which distinguish it from other bases in the Conset Line. The first is the built-in high quality rear casters which allow the unit to be moved with greater ease. The second is a full-width Cable Tray for superior cable management. The height adjusts from 26" to 46.5" at a rate of 1" per second, with a lift capacity of 176 lb. An Anti-Squeeze Protection System will automatically engage if the resistance increases noticeably while moving down. The unit is 61.625" wide and will support a wide variety of stock work surfaces, and will also work with most custom tops. The entire base is powder coated in an attractive silver color. This tabletop is optimized for corner applications as the rear of the top is perfectly square and will snugly fit into any 90° corner. This compact corner worksurface provides a front cutout for the user and enough real estate to allow the individual to access their full comfort zone with extra space to spare. The cutout allows the user to fully support their arms while working as it permits them to move further 'in' or 'over' the tabletop. The square sides at the back are 47.25" long, with a total width of the unit (the hypoteneuse) of 65.75". The tabletop is available in a Maple or Beech Veneer (on 0.875" thick MDF), and is Triple Coated with UV hardened lacquer with profiled lacquered rounded edges. A single grommet hole at the back of the tabletop (in the middle) assists in cable management. To find out which bases are compatible with this tabletop, consult our base/tabletop compatibility chart. This tabletop is designed for corner applications as the rear of the top is square but rounded and will fit into any 90° corner. This compact corner worksurface provides a shallow front cutout for the user and enough real estate to allow the individual to access their full comfort zone with extra space to spare. The longer sides at the back are 46.0625" long, with a total depth of 35.4375". The tabletop is available in a Maple or Beech Veneer (on 0.875" thick MDF), and is Triple Coated with UV hardened lacquer with profiled lacquered rounded edges. The Fixed Leg Set from Conset offers a solution for Sit-Stand workstation layouts where additional "non-elevating" work space is desired. 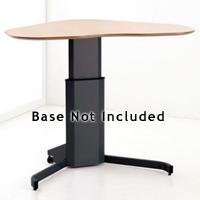 The leg sets (available in Black or Silver) can be easily attached to any top capable of accepting screws and can be used to provide a "sitting height" space for conferring with clients or co-workers without the necessity of lowering the entire worksurface. 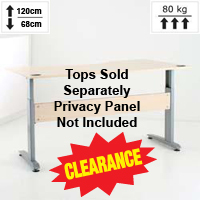 It also offers a more cost-effective solution where only a portion of a workstation (especially corner workstations) needs to be height adjustable. 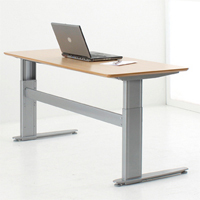 In these cases, a single or two-leg height adjustable frame can be used to elevate the worksurface while the secondary worksurface(s) can be supported by fixed legs. 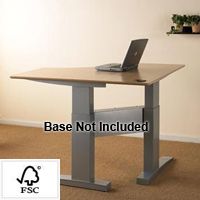 These legs can also be employed to replace support and restore stability which can be lost when detaching a portion of a complete desk for conversion to a height adjustable desk. 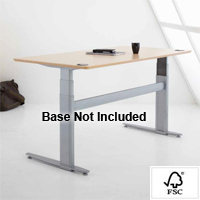 The 27.25" metal legs are equipped with cast metal mounting plates for secure attachment to any desk surface that can accept standard screws and feature a height adjustable foot that provides an additional 0.75" of adjustment range. When calculating the finished height of a mounted worksurface remember to add the thickness of the work surface or table top that is to be added. This tabletop provides a compact radiused corner worksurface with a cutout for the user and enough real estate to allow the individual to access their full comfort zone with extra space to spare. At the edges, this shaped worksurface is 55.125" wide x 35.4375" deep, enough to provide a reasonable work area for most users. The tabletop is available in a Maple or Beech Veneer (on 0.875" thick MDF), and is Triple Coated with UV hardened lacquer with profiled lacquered rounded edges. A single grommet hole at the back of the tabletop (in the middle) assists in cable management. These tabletops provide a standard rectangular work surface which easily blends into most office settings and provides individuals with a familiar, conventional desktop. The work surfaces are all 23" deep, and range from 22" to 70" wide, and are designed for fixed width cubicles. This allows them to be easily integrated i.e. the 48-24S series is 46" x 23", and allows a 1" clearance space on three sides for cubicles designed for a 48" x 24" desktop. The tabletops are available in a Beech Veneer (on 0.875" thick MDF), and are Triple Coated with UV hardened lacquer with profiled lacquered rounded edges. Two 8 cm grommet holes (one in each corner at the back of the top) assist in cable management. 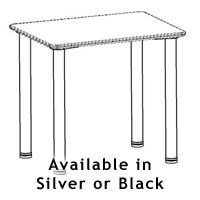 To find out which bases are compatible with these tabletops, please consult this base/tabletop compatibility chart. 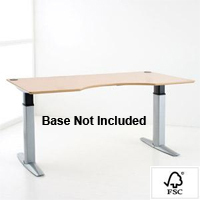 These tabletops provide a standard rectangular work surface which easily blends into most office settings and provides individuals with a familiar, conventional desktop. The work surfaces are all 29" deep, and range from 40" to 82" wide, and are designed for fixed width cubicles. This allows them to be easily integrated i.e. the 48-30S series is 46" x 29", and allows a 1" clearance space on three sides for cubicles designed for a 48" x 30" desktop. Two 8 cm grommet holes (one in each corner at the back of the top) assist in cable management. The tabletops are available in Beech or Black Melamine* with some sizes still available in Veneer* (on 0.875" thick MDF), with profiled lacquered rounded edges. *Note: These tops are transitioning to a Melamine surface for the future but some sizes are still only available in the triple lacquered genuine Beech Wood Veneer. The specific model descriptions below indicate whether the product is Melamine or Veneer surface. 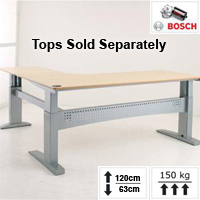 These tabletops are a rectangular shape with a front cutout which facilitates access to the full comfort zone of the user, by bringing them 'into' the work surface while providing full support for the arms. They are available in 3 sizes allowing one to select the optimal amount of desktop for their needs. The work surface is 47.25" / 63" / 78.75" (120/160/200 cm) wide and 39.325" (100 cm) deep. These tabletops are available in a Beech or Maple Veneer (on 0.875" thick MDF), and are Triple Coated with UV hardened lacquer with profiled lacquered rounded edges. Two 8 cm grommet holes (one in each corner at the back of the top) assist in cable management.